Distributed Antenna Systems | Fancom Connects Ltd.
1) The wireless service provider sets standards, may provide funding, and provides the RF source. 2) The equipment manufacturer provides the necessary hardware including antennas, cabling, signal amplifiers and signal converters. 3) The facility manager/owner provides the space in which the DAS is hosted and operates. 4) The systems integrator is responsible for design, installation and commissioning of the system while liaising between the other partners. 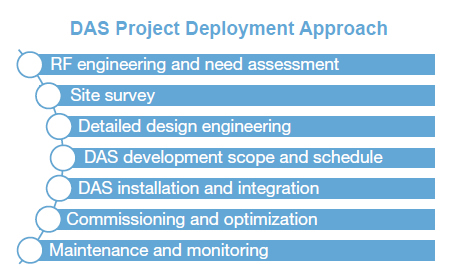 DAS can provide coverage for both indoor building spaces (iDAS) and outdoors (oDAS). Antennas are physically connected to a wireless carrier’s network base station. DAS operates on the RF spectrum that is licensed to these Carriers; therefore a business enterprise cannot undertake a DAS deployment on its own without the involvement of at least one such carrier. There are three types of DAS networks: passive, active and hybrid. Each type has strengths and weaknesses that should be carefully considered for the particular design application they are being used for. Passive DAS networks are relatively simple in terms of complexity as there are no electronic components. Coax cable allows multiple frequencies to be used but the cabling is relatively heavy and can be expensive. Passive systems are not suited to large facilities or long runs, as the RF signal diminishes over longer distances, and individual nodes along the network cannot be monitored or controlled. Active DAS deployments use signal amplifiers along the route and therefore provide consistently strong signals to each node along the system. Active DAS is ideal for large buildings, is easy to install using highly versatile fibre optic cabling and all nodes can be monitored and controlled from a central source. Multiple sets of electronics may be required however for pushing multiple frequencies and may therefore add cost to the system. the power required for the single larger antenna. DAS is often used where terrain and zoning restrictions make more traditional means of connectivity a challenge.